F riday, May 2, 20144Hometown News PORT ST. LUCIE www.HometownNewsOL.com 097279 783918 Please Contact Me for Y our Advertising Needs in East Port St. LucieGlenn JohnstonSenior Advertising Consultant772-528-9014GJohnston@HometownNewsOL.com Celebrating Mother Earth In celebration of Earth Day Chesterbrook Academys 200 students release 6,000 ladybugs in Port St. Lucie on Aug. 22.Above: Preschool teacher Miss Hoffman watches as Amani Webb, 3, finds a lady bug on his sleeve. L eft: Preschooler Rei Toussint, 3, discovers a lady bug on his arm.Sevin Bullwinkle/staff photographer Sevin Bullwinkle/staff photographerPreschooler Cassidy Bowell shows a lady bug to Austin Brower, 3, of Port St Lucie. Hometown News PORT ST. LUCIE www.HometownNewsOL.com F riday, May 2, 20145 092580 093919 Arrests made from April 15 through April 25Port St. Lucie Police Department Kip Warren Rayside, 18, of 2108 S.E.Shelter Drive, Port St.Lucie, was charged with grand theft, two counts of possession of a w eapon or ammunition by a Florida delinquent, possession of marijuana with intent to sell and possession of marijuana of more than 20 grams. Eric Hallman, 48, o 1471 S.E.Grapeland Ave ., Port St.Lucie, was arrested on two active w arrants. Melissa Ann Nunziato, 38, of 935 S.W.24th Street, Vero Beach, was arrested on an active w arrant for felony prostitution. Justin Cruz, 23, of 716 Rocky Bayou Terr ace, Port St.Lucie, was arrested on an active w arrant for dealing in stolen property. Lisa Marie Lawrence, 49, of 1502 Janette Av e. S.W ., Port St.Lucie, was arrested on four active warrants for three counts of grand theft and organized fraud. Joseph Tower, 59, of 1555 S.E.North Blackwell Drive, Port St.Lucie, was charged with possession of marijuana of more than 20 grams. Tito Aquantis James, 29, of 622 N.W. Bayshore Blvd., Port St.Lucie, was charged with felony battery by strangulation, grand theft and kidnapping. Matthew John McConnell, 39, of 1866 S.E. V esthaven Court, Port St.Lucie, was charged with burglary and grand theft. Timothy Joseph Ferguson, 25, of 251 Cardinal Place, Fort Pierce, was charged with grand theft, grand theft auto and possession or use of paraphernalia to transport drugs. Nicholas Steven Kurth, 18, of 3372 S.W. Crestview Road, was charged with possession of cocaine. Joselyn Dume Flores De, 24, of 673 S.W. Haas Ave., Port St.Lucie, was charged with aggravated assault with ad deadly weapon without intent to kill and aggravated battery. Robertson Zachary, 21, of 2498 S.E.Alden Street, Port St.Lucie, was charged with aggrav ated battery with bodily harm. Elizabeth Marie Pitonack, 36, of 868 S.W. K oler Ave., Port St.Lucie, was charged with resisting an officer with violence and cruelty towards a child. Moyadha Mohamad Kasham, 23, of 153 N.W.Dorchester Street, Port St.Lucie, was charged with child neglect. Cristina Audette, 35, of 1881 S.E.High Springs Drive, Port St.Lucie, was charged with aggravated battery while offender knew or should have known victim was pregnant. Kim Lee Buffington, 23, of 362 S.W.Kentw ood Road, Port St.Lucie, was charged with grand theft. Tiffany Marie Thatcher, 22, of 352 S.W. K entwood Road, Port St.Lucie, was charged with grand theft. Charles Lee Johnson, 27, o f1512 S.E. Arenson Lane, Port St.Lucie, was arrested on an active warrant. James Michael Switzer, 17, of 878 S.W. Squirrel Ave., Port St.Lucie, was charged with aggravated battery. Kaitlyn Wilson, 22, of 5713 N.W.Jigsaw Court, Port St.Lucie, was charged with resisting an officer with violence. Stacy Doneen McGarry, 42, of 237 S.W. Langfield Ave., Port St.Lucie, was charged with our counts of possession of a controlled substance.St. Lucie County Sheriffs Office Adelphin Basquet, 28, of 1003 Gamble Street S.W., Moore Haven, was arrested on an out of county warrant. Eric Brown, 24, of 7202 Donlon Road, Lakewood Park, was arrested on four felony w arrants. Richard Carl Caldwell, 24, of 3025 Galt Circle S.E., Port St.Lucie, was arrested on an active warrant. Christopher Thomas Ankiel, 139 Alma Court, Fort Pierce, was charged with possession of marijuana of more than 20 grams and possession of marijuana with intent to sell. Jasper Daniel Dempsey, 54, of 503 Quincy Ave ., Fort Pierce, was arrested on an active w arrant. Nathaniel Duane Allen, 30, of 2712 S.W. Somber Road, Port St.Lucie, was arrested on an active warrant. Randy Rodrigues Morrow, 18, of 9521 Por tside Drive, Fort Pierce, was arrested on an active warrant. Andy Phillips, 26, of 1255-337 53rd Street W est, Hialeah, was arrested on an active warr ant. Cecilia Alvarez, 29, of 3635 N.W.Mediterr anean Lane, Jensen Beach, was charged with interfering with custody of a minor. Wilferd Christopher Taylor, 27, of 1003 Hickory Street, Fort Pierce, was arrested on an active warrant for attempted robbery. Melissa Ann Billman, 29, of 104 S.W.Peacock Blvd., Port St.Lucie, was charged with possession of cocaine. Hayden Christian Hope, 20, of 342 S.E. Evans Ave., Port St.Lucie, was arrested on an active warrant for burglary of a dwelling. Malacai Raymond Bernard, 22, of 1994 S .E.Chettenham Street, Port St.Lucie, was charged with felony violation of probation. Aurelia Faith Walker, 18, of 2616 S.E. Morningside Blvd., Port St.Lucie, was arrested on an active warrant for burglary of a dwelling. Cristian Ignacio Santos, 18, of 1907 S.W. Sindmar Drive, West Palm Beach, was arrested on an active warrant. Anthony S.Flippen, 29, of 526 East Weatherbee Road, Fort Pierce, was charged with f elony driving while license suspended. Adrian Denis Romlan, 57, of 2049 S.E. Oxmoor Terrace, Port St.Lucie, was arrested on an active warrant. Garion Vondrell Collins, 31, of 1206 Palm W alk Lane, Fort Pierce, was arrested on three active warrants. Assony Ezlaus, 17, of 506-B North 15th Street, Fort Pierce, was arrested on two active w arrants or possession of a firearm and aggrav ated assault discharge of firearm. Christopher Brown, 33, of 1205-A Avenue L, Fort Pierce, was arrested on an active warr ant for third degree grand theft. Terrell Tavon Hill, 28, o 6240 N.W.21st Ave ., Apt.E, Miami, was charged with felony driving while license suspended. Gary Wayne Merrit, 43, of 121 12th Place S .E., Vero Beach, was charged with possession of a controlled substance without a prescription.Police reportEditors note: This is a list of arrests, not convictions,and all arrestees are presumed innocent unless or until proven guilty in a court of law.See CRIME, page 10 If you have information about a crime, call Treasure Coast Crimestoppers at (800) 273-TIPS. F riday, May 2, 20148Hometown News PORT ST. LUCIE www.HometownNewsOL.com Most Insurance Accepted RMBlatsteinpodiatry.com1635 NEJensen Beach Blvd. (772) 225-36681226 SE Port St.Lucie Blvd. (772) 337-2920THE PATIENT AND ANY OTHER PERSON RESPONSIBLE FOR PAYMENT HAS A RIGHT TO REFUSE TO PAY, CANCEL PAYMENT, OR BE REIMBURSED FOR PAYMENT FOR ANY OTHER SERVICE, EXAMINATION OR TREATMENT WHICH IS PERFORMED AS A RESULT OF AND WITHIN 72 HOURS OF RESPONDING TO THE ADVERTISEMENT FOR THE FREE, DISCOUNTED FEE, OR REDUCED FEE SERVICE EXAMINATION OR TREATMENT.093777 VISIT OUR OFFICE FOR AFREE CONSULTATION(MUST PRESENT THIS COUPON AT THE TIME OF APPOINTMENT) F actory Authorized & Trained TechniciansIndian River Co.6880 US Hwy. 1 Vero Beach, FL 32967 772 562-5759 Brevard Co. 321 723-4485 St. Lucie Co. 772 878-3353www.BrandtsApplianceService.com088491 OUTDOOR KITCHENS & GRILLS 783911 Babys Two Childrens BoutiqueNew & Gently Used Brand Name Items Consignment Sell Buy TradeRENTALS AVAILABLE1728 SE Port St.Lucie Blvd. Po rt St.Lucie, FL.34952772-777-3570Babystwoboutique@gmail.com783912NOW OPEN $500OFFAny Purchase of $25 or More 337-5548f or your appointment9098 South Federal Hwy. (Eastport Plaza/Between Publix & Walgreens)783917Maria and the entire staff would like to welcome you to our salon. Stop By and Say Hello or Call HairMasters Styles, Inc.Let Us Give You A Fun New StyleW ALK INS WELCOME 8906 S.Federal Highway,PSL Village Corner Plaza772-335-1162James L. Strawn, D.D.S. 772-335-1162Call Now to Schedule YourFREE, No Obligation ConsultationFull & Partial Denture Same Day Repairs &Relines Denture Laboratory on Premises Mini Implants For Denture Retention Custom Designed Dentures at Affordable Prices783920 093716 Licensed Sales Agent 1164 SW Hunnicut Ave. Port St. Lucie, FL 34953 Cell 561-315-8218 Fax 772-353-5322 gbicksler77@gmail.comT erm, Whole &Final Expense Life Insurance Authorized to offer Medicare Advantage, Prescription Drug Plans and Medicare Supplement Insurance Plans Garry Bicksler Reporter faces challenge of mud, snakes and obstaclesTREASURE COAST The sun was shining, sneakers we re doubled-knotted, racers were pumped, and my practically luminescent coral running shoes were one of the many pairs toeing the line at the Treaure Coasts first C ourage Challenge mud and obstacle race last weekend. It wasnt my first mud run; Ive participated in a couple Warrior Dash races in Texas and Florida, but both r equired one to two hour drives before and after the r ace. This inaugural mud and obstacle run was just down the road and I wasnt going to miss out. This was, however, my first race longer than five kilometers. See, despite the fact that my dad is an avid runner, I am not. He coaches track and cross-country at my old High School and runs marathons in under three hours, but I guess passion and ability for the sport are not hereditary. B ut I lace up my shoes and hit the pavement anyway because I know its good for me and I do love a challenge, especially if it involves mud, sweat or feats of strength and agility. Hence the mud runs. My husband Josh and I ran it together (and ran the distance we did), as we have all of our previous obstacle courses. We stuck together, encouraging one another as we pulled ourselves over wooden barricades and climbed to the top of a very slippery cargo net. We encouraged our fellow runners, too, as we passed them or they us on the sometimes long stretches of trail that connected obstacles. They started out easy with balance beams and low hurdles then increased in difficulty. We were warned to watch out for snakes and alligators as we swam across a creek, used a rope to climb a barrier then slid down into muck on the opposite side, and scaled a sheer wall that r equired quite a drop from the top. It was a challenging course that twisted and turned through Halpatiokee Park and wasnt for the faint of heart. The course required stamina and a healthy lack of fear to make it over some of the obstacles. Hence the moniker Courage Challenge. B ut none-the-less, runners of all ages and athletic ability participated and event co-organizer Jennifer C amp said It was really great to see all different types of people out there coming together to do something empowering. Thats what its about, after all: pushing yourself to the limit, feeling that sense of accomplishment, and pumping your fists in the air in victory when you cross the finish line. Oh, and the race medal and T-shirt proclaiming, I have the courage. Close to 1,000 people participated in last weekends event and Ms. Camp said she hopes to increase that number at future events, including the second annual early next year. And next year it will be even bigger and better with more mileage and tougher obstacles for the serious obstacle course racers out there. F or details and dates for upcoming events,visit www.couragechallenge.com. I f you joined me at the race and havent taken a look at your finishing times or race photos yet,check out www.splitsecondtiming.com for all the details. By Alisha McDarrisF or Hometown NewsPhoto courtesy of Alisha McDarrisCourage Challenge participants have to wade through murky water and crawl through mud to get to the finish line at the first race of its kind at Halpatiokee Park in Stuart last weekend.Photo courtesy of Alisha McDarrisJosh McDarris of Stuart launches himself over waist-high obstacles during the Courage Challenge at Halpatiokee Park in Stuart last weekend. 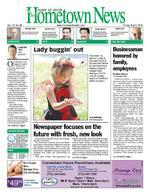 Hometown News PORT ST. LUCIE www.HometownNewsOL.com F riday, May 2, 201411 0929691374 SEHuffman Rd. P ort St. Lucie, FL 34952www.carpetsetcpsl.com Bob &Kathy KantorProud OwnersTHANK YOU PORT ST.LUCIE FOR MAKING US#1A GAIN ! !772-878-4707 F AX:772-878-4767 The Atlantic Animal Clinic1315 NE Sunview Terr. Jensen Beach093773 Call 334-5901for an appointment Broken Bones,Bladder Stones... Dont Panic,for second opinion Call A tlantic Animal Clinic30 years ofsurgical experience We may be able to save you money!VaccineClinicSaturday,May 17th $500Rabies ShotsCash &Check Only 8 AM 11 AM OFFICE LOCATIONS IN PORT ST. LUCIE AND STUART1801 SE Hillmoor Drive, Suite A104, Port St. Lucie, FL34952 407ASEOcean Boulevard, Stuart, FL34994772-398-4550 Like us on www.facebook.com/Dr.Shipe Stuart S. Shipe, DAOM, PABoard Certified Acupuncture Physician Χnese Herbalist Registered PharmacistLEADER OF THE TREASURE COAST FOR ACUPUNCTURE &TRADITIONALCHINESE MEDICINE Relief from Disease or PainHost of Better Way to Health WPSLAM1590 Thursdays at 11 amAcupuncture, Qi Gong, Herbal Medicine, Nutrition Counseling, Tuina Massage Therapywww.TraditionalChineseHealing.com FREE $95.00 COMPLIMENTARY CONSULTATIONW ith this coupon or mention this ad *Does not include exam or treatment. New Patients Only 783914 784055 Great Items! Great Rates! Great Results!Call 1-800-823-0466for more information Treasure Coasts Largest Selection of Electronic Cigarettes since 2010 E-Juice and Accessories Over 200 Flavors made in USA920 SW Bayshore Blvd. Po rt St.Lucie772-800-3273784073 20% OFF STARTER KIT Complete E-Cig Charger & E-LiquidB UY 2 E-LIQUIDS GET 1 FREE! Exp 5-31-14 Exp 5-31-14 Mon.~Sat. 11am~6pm Sun. 11am-4pm Knowledgeable Staff / Service & Repair Treasure Coasts Only Premier Oxygen Bar and Vape Lounge 092573PSL772-464-0019Hours:Mon-Sat 1pm 9pmR E N T A L SA V A I L A B L E50% OFF! 50% OFF!Allregular pricedAdult DVDsADULTD VDsstarting atMOST ALL ADULT VHS TAPES3223 S. U.S.Hwy. #1 Fort PierceLocated behind Long John SilversDiscount Video Too Discount Video Too SPEND $50 ORMORE, GETANOTHER10% OFF!Must Present Ad$4-8$4Embracing diversity at Treasure Coast Pride Sevin Bullwinkle/staff photographerP ort St. Lucie resident Rafael Gomez, a Zumba instructor at Natures Way in Fort Pierce, performs as Elsa from the Disney movie Frozen. Sevin Bullwinkle/staff photographerRianna Petrone takes center stage.Sevin Bullwinkle/staff photographerFr ank Samuel of Fort Pierce offers free hugs.Pride of the Treasure Coast celebrated the 10th annual PrideFest at the Port St. Lucie Civic Center on April 27. F riday, May 2, 201424Hometown News PORT ST. LUCIE www.HometownNewsOL.com 2822 S. U.S. #1, Ft. Pierce(772)466-7022The OriginalFINANCING AVAILABLE MUST PUT SALES TAX DOWN. WE ARE NOT RESPONSIBLE FOR TYPOGRAPHICAL ERRORS. PRICES AND FREE OFFERS ARE NOT VALID ON PRIOR PURCHASES. FREE OFFERS AND NO INTEREST OFFERS ARE NOT VALID ON NEGOTIATED PRICES. MILITARY, POLICE, FIRE DEPARTMENT, INTERNET DISCOUNT CANNOT BE COMBINED OR USED ON AD ITEMS OR COUPONS. SOME ITEMS ARE ONE OF A KIND AND CANNOT BE PUT ON LAYAWAY. SOME PICTURES ARE FOR ILLUSTRA TION PURPOSE ONLY. SAME DAY DELIVERY PURCHASE TO STUART, PORT ST LUCIE, FORT PIERCE, OR VERO MUST BE MADE BY 3 PM. NO SUNDAY OR HOLIDAY DELI VERIES.Mon-Fri 10am-8pm Sat 10am-6pm Sun 12-5pm ALWAYS IMITATED NEVER EQUALED FREE EASY LAYAWAY NO TIME RESTRICTIONS NO INTEREST!! !FREE FINANCINGAVAILABLE SAME AS CASH AND REGULAR REVOLVING ACCOUNTS Apply for your Discount Furniture Credit Card Today!DISCOUNT FURNITURE $179RECLINERS INCLUDES: DRESSER, MIRROR, 2 NIGHTSTANDS, FULL/ QUEEN HEADBOARD AND CHEST CHOICE OF 5 COLORSPRESENT COUPON AT THE TIME OF PURCHASEALL 6 PIECES FOR CHESTS$78FROM TV STANDSWide V arietyfrom$48DAYBED with INTERSPRING MATTRESSfrom$198 CLICK CLACK SOFA BED$159WOOD TABLE AND 4-CHAIRS$199$586 FOOT BOOKCASEFROM LARGEST MATTRESS RETAILEROVER 45 DIFFERENT MATTRESSES TO CHOOSE FROMMEMORY FOAM MATTRESSPILLOW TOPTWIN MATTRESS..from$89TWIN SET................from$139FULL SET................from $169Q UEEN SET............from$199KING SET................from$299TWIN....................................$199FULL....................................$269Q UEEN................................$289KING...................................$399POWER LIFTRECLINERSPOWR LIFTAMERICAN MADENOW! $548 SOFA AND LOVESEATCHOICE OF 4 COLORS 2 PIECE SET $498$349 P ADDED HEADBOARD, FOOTBOARD, RAILS, SLATS$149 ADJUSTABLE BED BASEStarting at$649 NO CREDIT CHECK OPTION AVAILABLE VIRGINIA COLLEGE REAL WOOD DRESSER, MIRROR, QUEEN HEADBOARD, FOOTBOARD, RAILS, SLATS, AND NIGHTSTANDDEEP DISCOUNTS ON ALL WICKER AND RATTAN $598 10 PC 2 ROOM P ACKAGE$999SOFA$299Choice of Colors TWIN SET..........from$169FULL SET..........from $199Q UEEN SET......from$229KING SET..........from$339783900 LARGEST SELECTION OF DISCOUNTEDSOFAS, LOVES, RECLINERS, SECTIONALS, COCKTAIL AND END TABLES, WALL UNITS, ENTERTAINMENT CENTERS, RUGS, LAMPS, ART, BEDROOM, BEDS, YOUTH, DINING ROOM, DINETTES, DAYBEDS, FUTONS, FLIP FLOP SOFA, SLEEPER SOFA! NO ONE BEATS THE ORIGINAL DISCOUNT FURNITURE BOTTOM LINE! UP TO 30% OFF DISCOUNT PRICES STOREWIDE ON SELECT DISPLAY MODELSREAL WOOD DRESSER, MIRROR, HEADBOARD AND NIGHTSTAND$788 www.theoriginaldiscountfurniture.comMUST PRESENT THIS AD AT TIME OF PURCHASE FOR THESE HUGE SAVINGS NO EXCEPTIONS!